Bringing home a puppy is a joyous event. First and foremost, they’re incredibly cute. Has a human ever encountered a puppy without smiling? Of course not. But choosing a puppy is no laughing matter. Puppies grow – all too quickly – into dogs. So it’s critically important to make informed decision about acquiring a puppy. Too frequently, common sense goes out the window when it comes to buying a puppy. This seems even more evident when the puppy is purchased by a family with young children. If you’re living alone, are you prepared to feed, bathe, walk and play with your dog – every day? If you work late or are going out with friends every night, you’re likely not ready to take on the responsibility of owning a dog. If you’re welcoming a puppy into a family household, will there be a primary caregiver or will the family share such tasks as cleaning the puppy’s accidents and ensuring that the water bowl is never empty. The bottom line: you or your family must be willing to devote the time and energy necessary to all but guarantee your dog’s health and happiness. Think of the purchase price of your puppy as something akin to a down payment. There are plenty of expenses ahead. You will need to buy puppy supplies: a collar with identification, a leash, food and water bowls, food and treats, a dog bed (many owners recommend dog crates). The list goes on. Your puppy also will require visits to a veterinarian for such things as annual examinations and vaccinations. Evaluate your budget; ask yourself if you really can afford a dog. There is no doubt that a puppy is a cuddly bundle of joy, but it is also an expense. 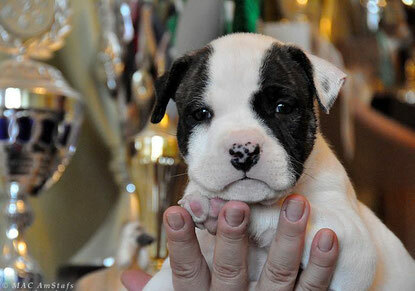 Is American Staffordshire Terrier suitable for you? Courageous and strong, the American Staffordshire Terrier (AmStaff)'s athletic build and intelligence make him ideally suited to many dog sports such as obedience, agility, tracking and conformation. He is often identified by his stocky body and strong, powerful head. The breed's short coat can be any color, and either solid colored, parti-colored or patched. The Am Staff is a people-oriented dog that thrives when he is made part of the family and given a job to do. Regular exercise and training are necessary. They are natural clowns, so they tend to make training comical at times; they like to put a little twist on your training program. It’s vital to keep it fun and interesting. A stubborn-streak can make them difficult to train at times and will require patience and a firm, but kind, hand. The life expectancy of this breed may be 12-16 years with good care. Take this into consideration when purchasing a dog. 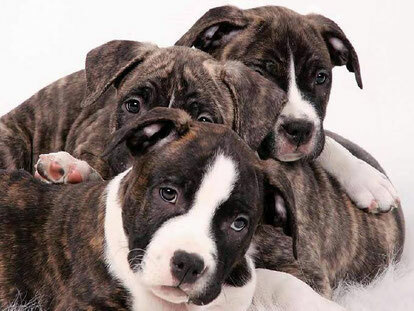 Generally, health of an AmStaff is good, and the dogs have exceptionally strong consitutions. Never purchase an AmStaff from a pet retailer. Acquire a dog only from an FCI (or its contract partner) registered breeder. Ask the breeder what health screeing they do on their breeding stock, and the results of that screeing. Breed History. AKC Breed Standard & explanations.